Trevor Anderson gave up his life as a Navy SEAL when he lost his best friend in an ambush. Before his friend died, he’d promised him he’d take care of his wife, should anything happen to him. Trevor left the Navy and returned to his home state of Montana to follow through on that promise. Widow of a Navy SEAL, Lana works for Homeland Security, searching for answers behind her husband’s death. When she gets too close to the truth, she calls on her husband’s best friend for help. Trevor proposes that Lana move to Montana where he can look after her. She takes him up on the offer, hoping that hiding in the Big Sky state will cool the heat. She finds an entirely different kind of hotness in her relationship with her husband's best friend. While their passions ignite, her investigation catches up to her, threatening to raze the walls she's built around her heart. When a story makes you cry in the first chapter you know it’s going to be good, and this one sure doesn’t disappoint! Trevor not only lost out on winning the love of his life to his best friend, but now he loses his best friend while on a mission. Now a year later Lana is in trouble and reaches out to Trevor for help. As Trevor rushes to her side, her life is being threatened. Will he make it in time to save her? While trying to keep her alive, will they get a second chance to be together? This is an intriguing, suspenseful story, full of emotion and steamy romance. The action is fast paced and engaging, and the characters are strong and interesting; keeping your attention from beginning to end. Each story can be read as a standalone, but the Brotherhood Protector characters are integrated into the whole series. I highly recommend you read this very enjoyable story and series! ARC for honest review with no compensation 4.5 stars Montana Seal Friendly Fire is book 11 of the Brotherhood Protectors series and another great book by Elle James. Trevor Anderson retired from the Navy Seals after his best friend was killed in an ambush in Afghanistan but before he died "Con Man" asked him to take care of his wife, Lana, since he was not making it back to her. Trevor agreed but has a slight problem...he is also in love with Lana. See these three were know as the Three Musketeers and both men fell in love with her. Now Trevor works for the Brotherhood and when he received an odd message from Lana, he knows he has to go see her and find out what it means. Little does he know that he may be running out of time to save her. Lana has gotten in way over her head after she started digging on the dark web about what happened when her husband and his fellow Seals were ambushed and he died with a bullet to the back. She goes to work for the Department of Homeland Security and finds more than she ever thought possible...homegrown terrorists wanting to take over the government.. After setting up and appointment with the FBI to give them all the information she has discovered she knows she will have to find somewhere safe to lay low for a while. Now more than ever she needs Trevor's help but can he make it to her in time to keep her safe from harm and build a life together or will Trevor fail yet again?? Heart-stopping action and great romance! Montana SEAL Friendly Fire is a fantastic romantic suspense by Elle James. Ms. James has delivered another well-written book and loaded it up with outstanding characters, some old friends from previous books, some new characters for readers to love. This is a fairly quick read, perfect for those with limited reading time. Trevor and his best friend loved the same woman. His friend beat him to the proposal punch. When his friend is killed in combat, Trevor finishes his time and leaves the SEALS for the Brotherhood Protectors in Montana. When Lana, the widow of his friend calls and leaves a message she needs help and then says nevermind all in the same message, he's off to California. Lana and Trevor's story is loaded with action, suspense, humor and sizzle. 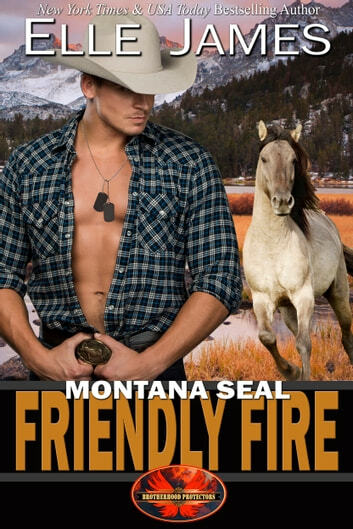 Montana SEAL Friendly Fire is book 11 of the Brotherhood Protectors Series but can easily be read as a standalone. This is a complete book, not a cliff-hanger. I voluntarily read and reviewed an advanced copy of this book. All thoughts and opinions are my own.